“I’m honored that my colleagues have put confidence in me to serve as mayor of Moorestown again,” Jordan said. Moorestown Municipal Court Judge Lois Downey delivers the oath of office to Moorestown’s new mayor Stacey Jordan on Monday, Jan. 8 in Town Hall. This marked Jordan’s second time being sworn in as mayor surrounded by her family. Back row from left: Drew Jordan and Andrew Jordan. Front row from left: Moorestown Municipal Court Judge Lois Downey, Sydney Jordan and Stacey Jordan. On Monday, Jan. 8, surrounded by her family, Stacey Jordan took the oath of office for the second time. 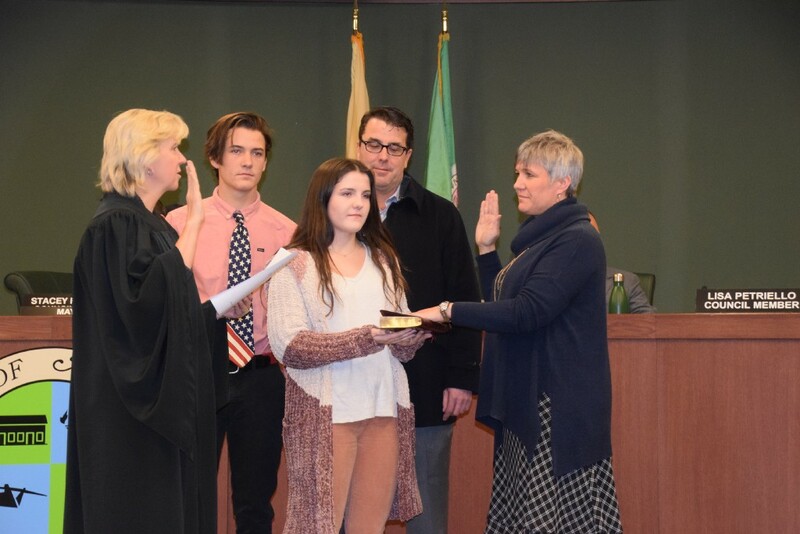 Having made history in 2013 as Moorestown’s first female mayor, Jordan was sworn in once again following a unanimous vote from council. The evening began with Jordan’s predecessor as mayor, Manuel Delgado, thanking his family, township employees and fellow council members for their support. He said when he accepted the position a year ago, he hoped to serve “respectfully and with integrity” while also moving the town forward, and he looks forward to continuing this work with council. “We don’t always see eye-to-eye on every issue, but we all do love this town,” Delgado said. Councilwoman Victoria Napolitano nominated Jordan, with Councilman Michael Locatell seconding the sole nomination. Jordan said council has worked hard to make fiscally sound decisions. Over the last two years, Moorestown’s credit rating has gone up, municipal taxes have gone down and Moorestown is on track to have some of the “cleanest water in the country.” She thanked her colleagues for allowing her the opportunity to help continue this work. During council comments, Petriello, council’s sole Democrat, said Monday marked the first time that a presumptive nominee for mayor or deputy mayor has reached out to her and discussed their intentions to run. She thanked Jordan for reaching out and said because she did so, she was happy to support her with her vote. Petriello said over the course of their phone call, Jordan expressed a desire to improve council’s communication, and she said she is “going to hold Stacey accountable” to do just that. Specifically, Petriello said she was troubled by the manner in which council handled committee appointments this year. She said, to her knowledge, council received numerous applications, but almost 40 percent of the appointments went to people who did not submit an application. Additionally, Petriello said she only received the finalized list of appointments two hours prior to its publication, which did not allow her sufficient time to make further inquiries. “I just wanted to make it known that I will be abstaining from approving some of these committees tonight because of that — because of lack of information in order to make those decisions,” Petriello said. Petriello also questioned if the township negotiates fee increases submitted by its returning professional appointments. She questioned why council didn’t instead consider going out for bids. Both Jordan and Township Manager Thomas Merchel countered that council does, in fact, negotiate rising rates. During the subsequent appointment resolutions, Petriello abstained from voting on more than half of the appointment resolutions. Locatell said this is the second year in a row Petriello has abstained from voting, and with many of the township’s projects operating on a tight timetable, issuing Requests For Qualifications for new professionals would not be fiscally responsible. Both Locatell and Napolitano expressed their disappointment in Petriello’s decision to abstain. “Lisa, you have the luxury in a way of being in the minority because you can make certain votes to make a point,” Napolitano said. Moorestown Township Council will hold a special meeting in Town Hall on Wednesday, Jan. 17 at 7 p.m. to provide updates regarding the township’s ongoing affordable housing negotiations. This meeting is open to the public.